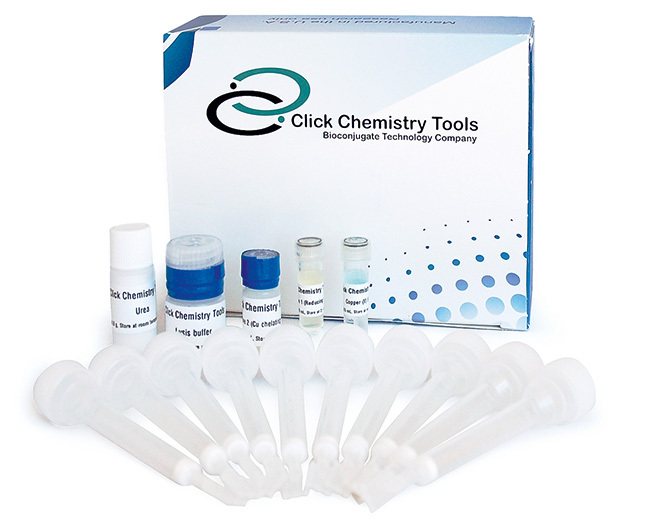 Click-&-Go™ Click Chemistry Capture Kit provides researchers who have proteins labeled with an azide or alkyne and the corresponding click resin with the means to covalently capture labeled proteins. Once covalently attached to the resin via copper catalyzed click chemistry, beads can be washed with highest stringency virtually eliminating any non-specifically bound proteins to yield a highly enriched population of nascent molecules. The kit contains specially formulated components to both catalyze the click labeling reaction and prevent non-specific binding to alkyne- or azide-modified resin. Captured proteins can be protease digested to yield a highly pure peptide pool that is ideal for mass spectrometry (e.g., LC MS/MS) based analysis, or release from beads under appropriate cleavage conditions for downstream analysis. Click-&-Go™ Click Chemistry Capture Kit is comparable non-cleavable agarose azide/alkyne, Dde, PC, and disulfide agarose resin. The biotin-free enrichment improves signal to noise by eliminating nonspecific binding and increasing selectivity, thus improving detection of low abundant proteins. This approach is fully compatible with widely used MS techniques including iTRAC and ICAT. The biotin-free, covalent capture approach is superior to biotin or lectin based enrichment approaches, and ideal for proteomics, biomarker discovery, posttranslational modification (PTM) analysis, and more. A newest generation, water-soluble accelerating ligand for CuAAC. A water-soluble ligand for copper-catalyzed azide-alkyne cycloadditions.